Owning to qualified tungsten carbides and heavy alloys, advance technology, modern facilities, excellent design ability and scientific management, Chinatungsten Online can offer pure tungsten, carbides, alloys and related products not only according to the normal standard, but also as per customers’ specific requirements. Reviewing our former business in the past 2o years, we found that some customers have no professional drawing soft system or even no professional designers. In order to improve our service, and for the sake of our long term co-operating, based on our abundant knowledge about tungsten, professional drawing designers, intelligent drawing operating system, we have set up a drawing designer group to offer our special service to customers. We can manufacture according to the drawings customers offered. 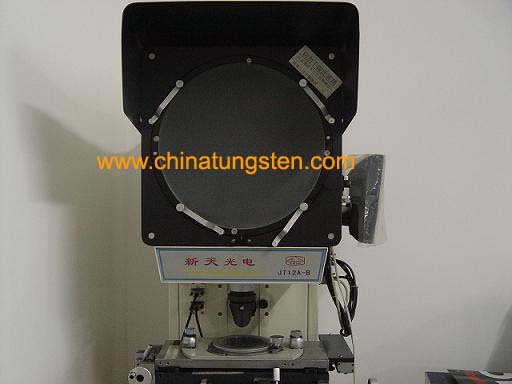 However, so long as we have been told the requirements about density, tolerance, density, we would design and make the drawings for customers, and then manufacture according to it. Even there is no concrete data information, just offered one sample, we could also make drawing for customer, which is our special ability to transfer material object into drawing paper. Please find the following photo of projector we used for that transfer. If you have any idea about tungsten heavy alloy products,please feel free to contact us at sales@chinatungsten.com, sales@xiamentungsten.com, we can offer drawing design for you. We always believe that your challenging requirement is the force for our advance. And please remember all of it is FREE!